I had a chance to speak with Geof Wheelwright, the Director of Marketing Communications at Atheer the other day regarding the results of an internal survey they did focusing on the use of Augmented Reality in the Enterprise market. 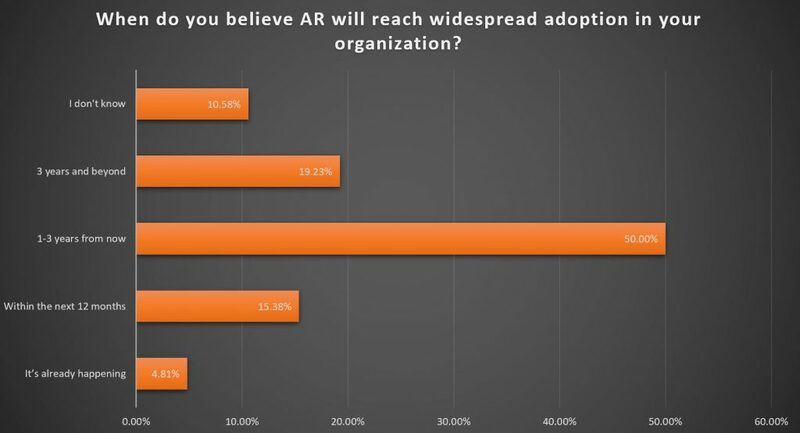 There were a number of interesting results but here is one clear highlight: 70% believe that AR technology will see wide spread adoption in the organization within 3 years. That’s huge and an indicator that awareness of AR is maturing and that trials are proving successful, leading to full deployments. The survey was emailed to a wide audience and received 248 responses – enough to be meaningful. These responses came from a wide range of industries including technology, mining, oil & gas, construction, manufacturing, transportation and warehousing, consulting/services, and education. Awareness of AR within enterprises is good, but can be better. Any negative impressions from the failed Google Glass consumer product have pretty much faded. 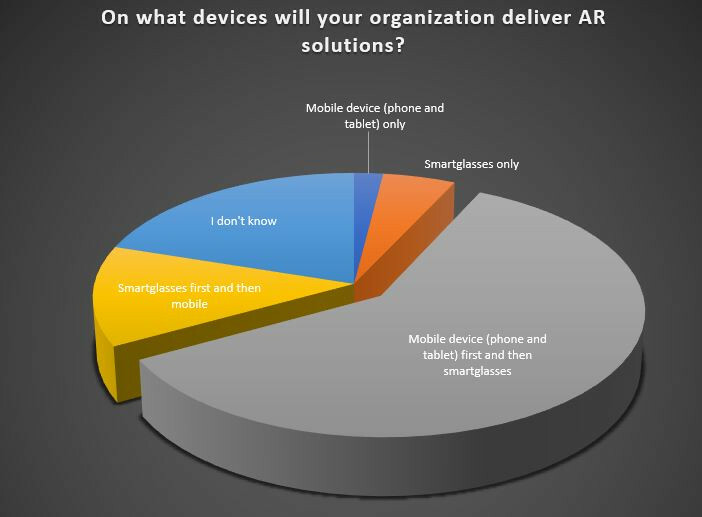 According to the survey results, 25% said there was limited awareness about AR overall within leadership, while 45% say that a few members of the senior executive teams in their organizations have taken the lead and the awareness is spreading’. Only 20% of enterprise respondents said that ‘a majority of leaders seem clear about the potential’ of AR, suggesting more education is needed. The survey also asked about the key barriers for deploying AR. 52% said ‘unclear return on investment’, while 49% said ‘AR hardware limitations’, followed by ‘a lack of understanding where AR could be used’ (39%). So what needs to be done to improve awareness and adoption? Wheelwright says that a lot of good information in now available at a large number of conferences devoted to AR/VR/MR, so start there. “Trails are key to gaining awareness and developing meaningful solutions with ROI, so we try to make this as easy as possible to accomplish and always suggest setting a baseline before the trial to measure improvements,” said Wheelwright. Another key to breaking down barriers is to leverage the existing infrastructure like hardware, connectivity, device management and security. This often means starting a trail on a phone or tablet to prove the benefit. In some cases where handsfree access to information is needed, the app can be migrated to a headset solution. “This was a clear preference from our survey,” said Wheelwright, “and very much aligns with the ‘mobile-first’ strategy that Atheer recently outlined as part of its new Augmented Reality Management Platform (or ARMP).” This is a cloud-based AR Management Platform that works with existing hardware and software in the enterprise and is designed to evolve to take advantage of new AR hardware and operating system enhancements. Atheer’s approach to the AR enterprise market has evolved over the years as well. They used to offer their own headset solution, but now offer headsets from several third party providers like Google Glass, Toshiba DynaEdge , Epson BT-350, Vuzix M-300, Realwear HMT-1, Thirdeye Gen X-1, and ODG R-7. Atheer apps run on Android and iOS mobile phones and tablets and that support ARCore and ARKit. Some of these headsets are what we might call “assisted reality” that provide data and information mostly in monocular headsets as 2D images at fixed-focal distances. Some are more augmented reality devices offering stereoscopic 3D images with virtual objects anchored to the real world. The survey also asked for the areas of biggest potential for AR, as shown in the chart below. Training and remote assistance top the list, closely followed by maintenance & repair and Manufacturing/Assembly/Quality Control. The use of AR in consumer markets seems mired in cute demos useful occasional apps like visualizing furniture in your setting. So far, there are no applications where AR would be helpful for longer periods of time, which is why there is a lot of emphasis on the enterprise market. And for good reason. If companies can show a benefit to suing some version of AR, they will adopt it. And they may be adopting it in a big way in the not-so-distant future.